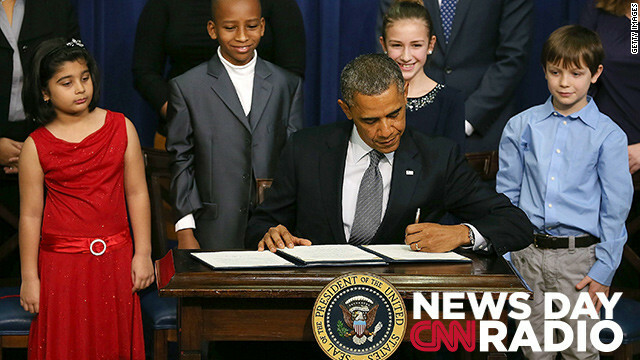 U.S. President Barack Obama signs a series of executive orders about the administration's new gun law proposals as children who wrote letters to the White House about gun violence, (L-R) Hinna Zeejah, Taejah Goode, Julia Stokes and Grant Fritz, look on. "This will be difficult. There will be pundits and politicians and special interest lobbyists publicaly warning of a tyrannical all-out assault on liberty." "There's no common theme to any of the incidents: a cracked cockpit (window), a fuel valve, a smoke alarm, lithium batteries. And so for Boeing and the FAA and Japanese authorities to determine what might be behind it, it becomes that much more difficult. " "I don't think any of us, anybody, certainly in any flood area, anybody that has flood insurance – would have ever expected to be in a position where they had to fight for every dime. Where they were constantly calling their insurance companies, and where the money is just taking so long to get to people."